There is another pictograph at Paint Rock that has gotten my attention. It is a rather complex set of images that contain a W-shape in several places , all within a few feet of the main panel. I knew that W shape was very familiar and I then noticed that every time the W was in a picture, so was a star-like image , always in the same place. This set me to thinking that it looked like Cassiopeia and I thought I remembered there had been a supernova there and I went home and looked it up on the internet and sure enough, there had been that observed as early as November 6, 1572 , observed by Tycho Brahe, the Danish astronomer and others and it was close to the spot shown in the paintings. A simple explanation is that the pictograph also shows stylized representations of other star groups in the area and a calendar showing it occurred in November - which it did, like a bud unfolding into a flower. This supernova was bright enough to be seen in daylight for a couple of weeks and became as bright as Venus. This would have shaken up the local folks when something that spectacular pops up out of nowhere. This would have been a very alarming experience for them and worth such a prominent place among the rocks. After a few weeks it began to dim and slowly changed from bright white through yellow, orange and red and disappeared from sight after 16 months. Today it emits little or no visible light but is a strong source of X-rays. It's gaseous remnants are expanding very fast at about 9 times faster than the 1054 Supernova's gas cloud and is round rather than elongated (see Photo). After it disappeared from sight, nobody knew where it was until it's location was rediscovered in 1960 and recently photographed with what amounts to an X-ray camera. 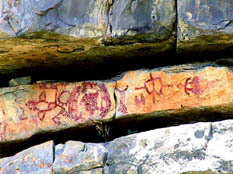 A more comprehensive explanation is that the pictograph has two halves, one on either side of a natural crack in the rock on which they are painted. On the far left side of the crack is a flower, the W that represents Cassiopeia and a picture of a turtle in a double circle and a sun around the rim of the double circle. The developing supernove must have resembled a flower opening up in blooming and thus it was painted as such - a great silent flower of incredible brightness in the sky. Anthropologists say the turtle in the rings is a symbol for the 13-month lunar year as observed by the Indians with the turtle's nose always pointing the first moon in the new year (the first moon after winter solstice) and if that is so, then the sun being shown in the 12th month would indicate that the event being portrayed occured in November of our calendar, which it did. The left side of the panel; therefore, appears to show when in the year the event happened. On the right side of the crack are stylized representations of other star groups in the area to show where in the sky the event ocurred. The leftmost symbol, looking like a dead tree with two big branches appears to represent portraying two of our constellations as one; they are Persius and Auriga. There are two diamond-like shapes in the painting and there are two diamond-like shapes that care formed by stars in the area(see illustration). The W representing Cassiopeia is next and the supernova is shown as a large cross, which is how it looked after it began to settle down after the initial explosion. The rightmost object appears to be a stylized turkey which is formed using pretty much the same stars as our astronomer used to form Cygnus the swan, however these Indians knew only turkeys but not swans. By the difference is appearance of the supernova , I surmise that there was about a month difference in when they were painted, the left one immediately at the time of the discovery of it in the sky, based on written descriptions in European histories written at the time.